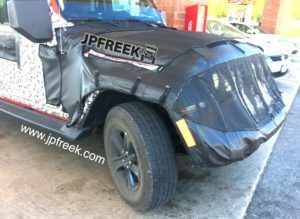 Exclusive JPFreek spy photos of the 2018 JL Wrangler in JLU form shot this morning by the big Freek. Nothing makes running errands in your 1977 Cherokee S better than coming across a heavily camouflaged JLU at the Speedway! 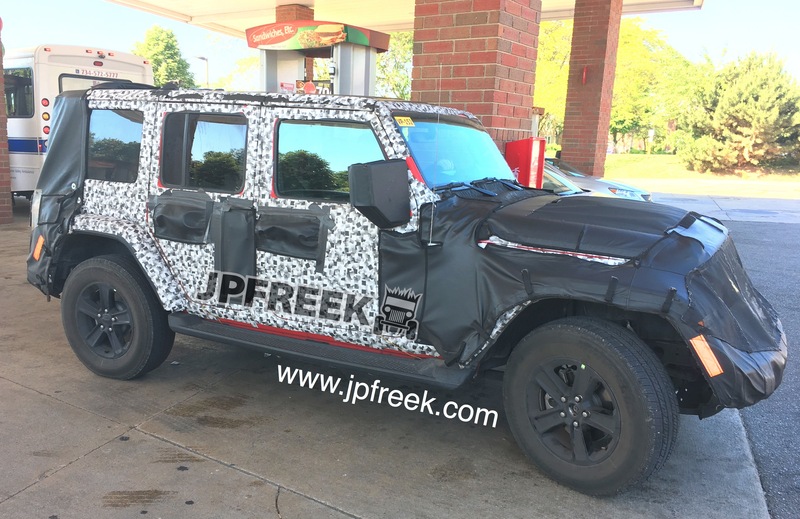 Low-angle rear view of the camo JL Wrangler showing new taillights and running board width. 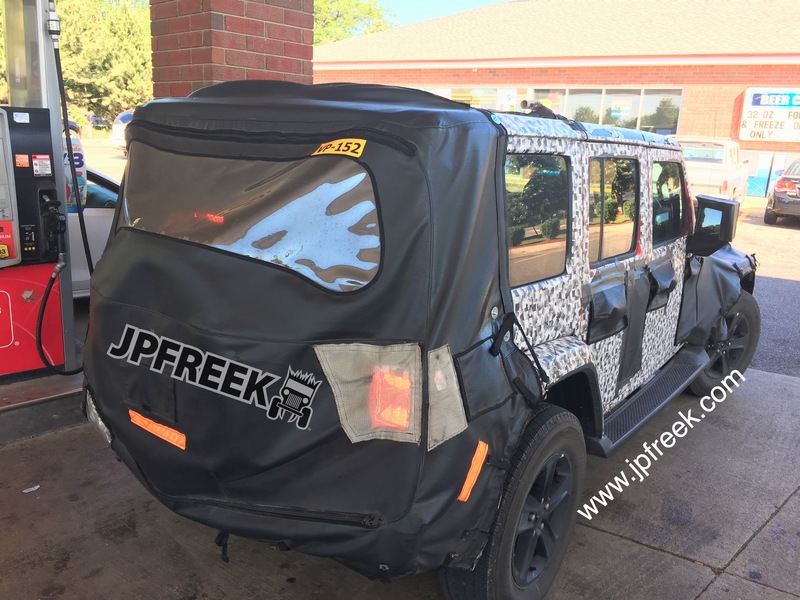 Obviously keeping the drivers side fuel filler and having filled it with gas (not diesel), this 2018 JL Wrangler was sitting idling with the driver waiting for his buddy to get an armload of Twinkies and energy drinks. The driver didn’t seem to mind us taking photos and even waved before the photography started, quickly trying to get as many angles as possible before it took off at a high rate of speed. The taillights appear to have some Renegade-esque design to them, maybe with more of the “X” we’ve seen from Jeep. High rear angle shows larger-looking Freedom panels for the JL Wrangler. Tried a high angle to see about any Freedom panels or a sunroof over the rear seats, but we only see some (rather larger looking) front seat Freedom panels with which we’ve become familiar. This angle also shows how large the JL Wrangler running boards are compared to the ones on our ’08 JKU. 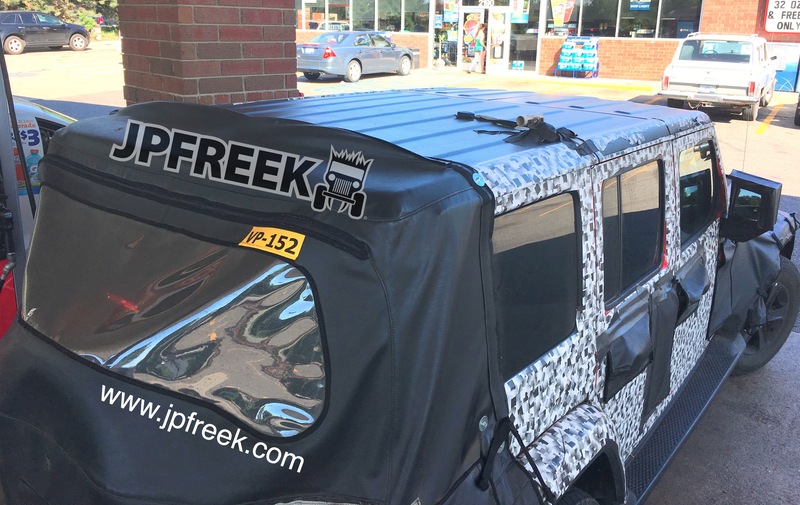 The snout looks longer in person but the wheels are a nice take on traditional Jeep designs. This JL Wrangler is sporting quite the hood bulge too. This JL has a significant and obvious hood bulge, but the idle had the typical quiet Pentastar-like sound. No Hellcat JL Wrangler here, unfortunately (and no diesel unless they made a stupendous screwup filling it up.) We’re straining to see any bulge below the windshield for a hinge to indicate that the windshield folds, but don’t think we can say either way. Closer view of the front end with the fender flare lights and wheels. 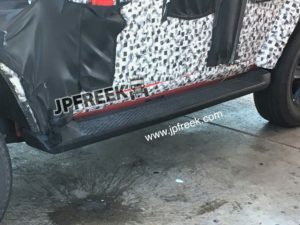 Good shot through the grille cover to see the two-tone fender flare light and what looks to be the same grille we saw on the few EJS concepts. 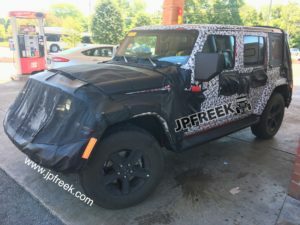 Hoping that bulge houses some serious power in the JL Wrangler — finally! The wheels are an interesting take on past designs, with larger openings and some contour to the spokes that we find very pleasing. Again, the hood bulge is clear. 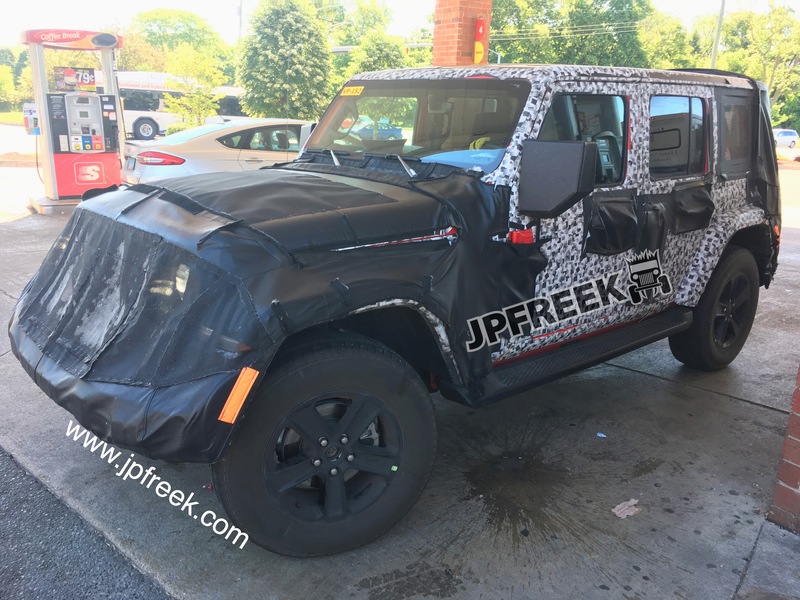 Hopefully that hood is making way for some serious power in the form of a Hellcat Hemi and the long-awaited diesel. The mirrors are enclosed in some seriously bulky boxes. 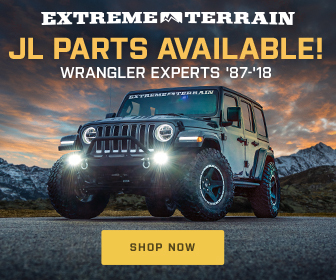 Apparently the JL Wrangler mirrors are super-secret. 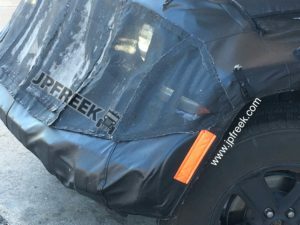 Closer view of the fender flare lights on the JL Wrangler. The fender flare light from the other side and that long beak. Had to get a shot of the wider side steps. We can’t wait to see the camo come off the new JL Wrangler line and hopefully get our hands on one with more power than the Pentastar, either in V8 or diesel form. Who else is holding out for one of the new Wranglers? Let us know in the comments. 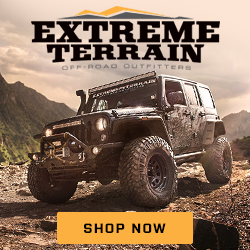 If you haven’t seen it already, be sure to check out our FREE all-Jeep magazine – click here.